The graphics in Micro Machines were admirable, very detailed for the time and surprisingly easy on the eyes as I hurtled along. In later versions there’s a wealth of superficial detail and some great interactive features to dodge and manœuvre around. Unfortunately, the sound is another story, being almost non-existent except for a revving motor during racing and some scattered blips and bleeps, which were more distracting than immersive. 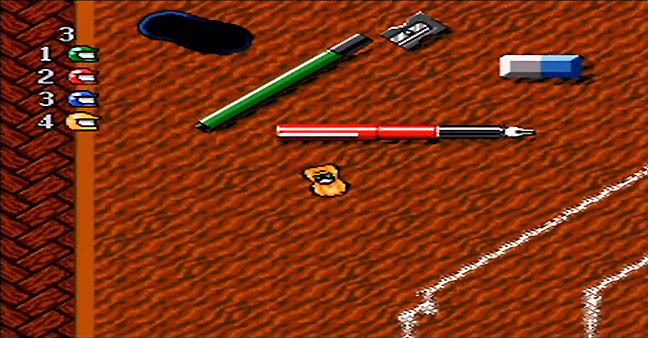 Developed from a simple premise, I was consistently surprised how difficult Micro Machines became in the later levels. Once I completed five or six tracks, the game starts throwing everything it's got at me. Miss a tiny bridge leading over the water and I’m suddenly at the bottom of a puddle. Twist the steering wheel even slightly while flying over an uneven portion of the track and I’m heading straight into a wall – or, worse still, off the table altogether. Every time I made one of these mistakes, I inevitably lost the race. Lose three times and it's Game Over. If I do manage to make it to the ninth race, the tracks morph into exasperating death traps. All this and, shock horror, there’s no ability to save the game. One of the most infuriating races takes place on some school desks joined together by ruler bridges. 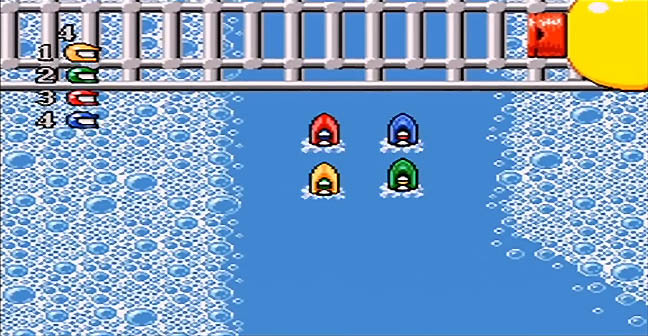 I remember spending over an hour completing the fourteen previous races only to lose all my valuable lives on this level and having to start from the beginning again. Other tracks I remember fondly are the bathroom, with its lethal plughole whirlpool, and the workbench, which was littered with gummy glue globules, haphazardly discarded nails and screwdrivers. 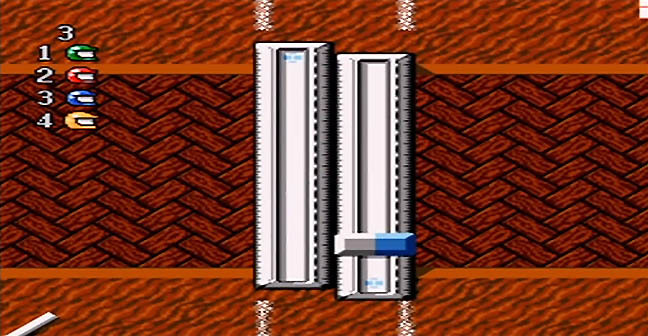 Ninety per cent of the skill involved playing Micro Machines is in remembering the next turn in time; five per cent is in manipulating the accelerator in the face of various pitfalls; and five per cent is in making use of any power-ups. Playing with a friend in head-to-head mode is a race to see who can make it far enough ahead of the other to push their vehicle off the screen. If I fall too far behind and my opponent scores a point, when the score gets to 8-0 either way, the game's up.